Happy Friday to you!! So glad the weekend is here! I am hoping to relax and just chill out! I have been feeling so under the weather this week. My Husband thinks I’m getting anxiety attacks, which I don’t understand why? I feel fine, than when I come home from work, my heart starts to race and I get the shakes. I know it’s not coffee and I know it’s not lunch, so what is it? My Husband thinks I am putting too much pressure on myself from blogging, wanting to exercise and weight issues. I don’t think those are my issues. If it was, I’d think about it! I have my normal routine when I get home and it has worked for over a year. I guess I’ll take it day by day and see how I feel. But one thing that does always make me feel better whether you have anxiety, sick or just want to feel good is soup!! Every two weeks, I get a box from the CSA and I love to be surprised with what I am going to get. For the past few times I have gotten carrots, carrots and more carrots! I said please, no more carrots!! Guess what I got? Carrots!!! 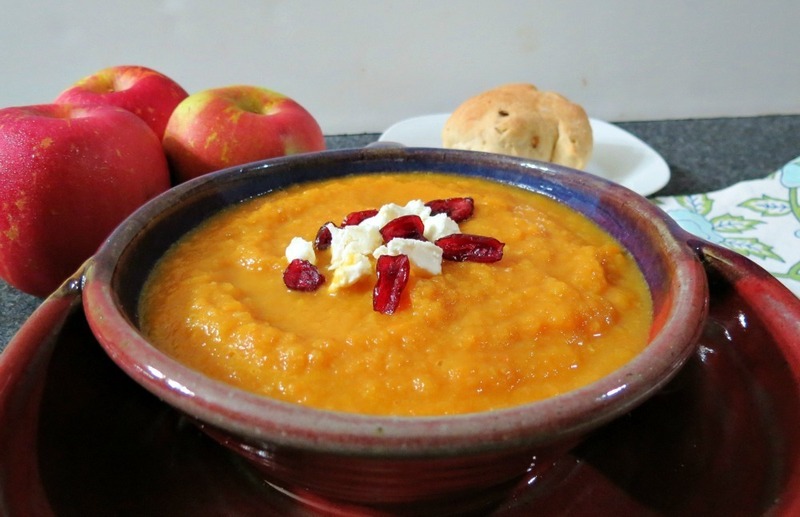 But in this weeks package there was a recipe for Roasted Carrot, Fennel and Apple Soup, which sounded so yummy to me! I figured had a bazillion carrots, it must have been meant to be! It takes a little bit of time to make, but it’s so worth it. For the soup, I roasted the carrots, fennel and apple together, then placed them in a pot, added some salt, chicken broth and a pinch of ground ginger. Mmmm, perfect! I honestly was afraid the soup was going to have a licorice taste because of the fennel, but it didn’t! It was creamy, slightly sweet and slightly peppery. It is a wonderful combination and very filling!!! Do you like my new Soup Bowls? I got them from Uncommon Goods. These bowls are hand crafted by Brian Knunkelman from Pennsylvania! I thought it was pretty cool and unique to have a one of a kind soup bowl! The bowl has a pocket for crackers and a handle to hold. I can so see myself holding one of these bowls as I’m snuggled in my blanket on the couch watching a movie! For me, I didn’t have crackers with my soup, but decided on my Cranberry Walnut Rolls, since to me it seemed perfect, since I topped my soup with goat cheese and dried cranberries!! My Husband on the other hand doesn’t like all the foo foo stuff in his soup, so he had to have oyster crackers with it!! The man can drown any soup with oyster crackers. Basically he has a bowl of crackers with a little bit of soup!! He loved his new manly silver toned bowl and I took the purple! Actually he took his new bowl with the handle and ran to the TV, as he left me in the kitchen. He loved the idea of having his crackers readily available Not saying he didn’t pour half a box in the soup! 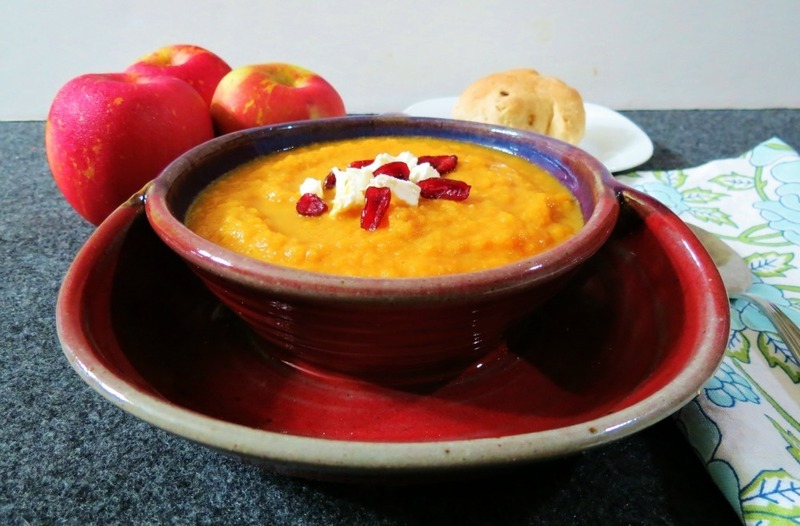 A creamy, healthy carrot soup, made with apples and fennel. Place carrots, apples and fennel onto baking sheet and drizzle with olive oil. Make sure to coat all the pieces. Place in oven and roast for 45 - 60 minutes, until carrots are tender, the fennel and apples with be soft. 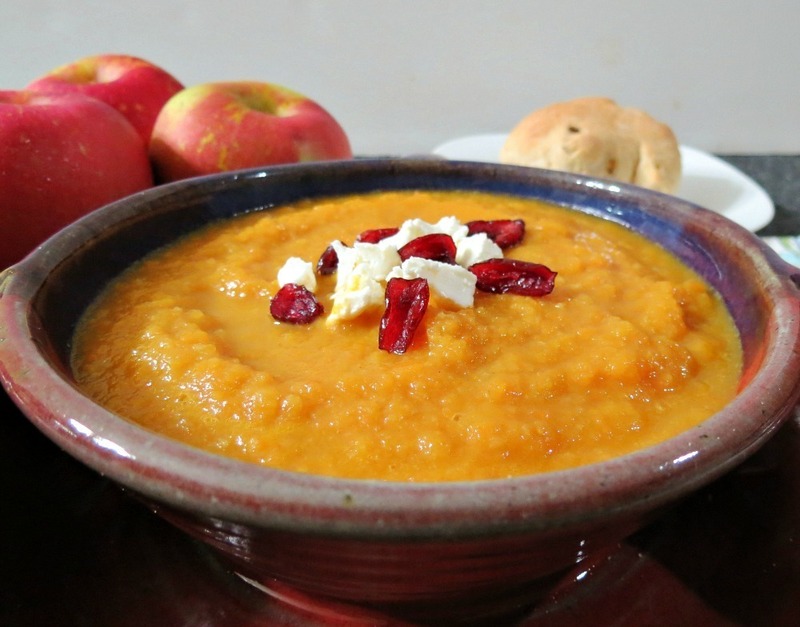 Remove carrots, apple and fennel and place in a large pot. Add garlic, ginger, salt and chicken broth. Bring to a boil, then simmer for 15 minutes. With a Emerson blender, blend soup together or carefully place in batch in a food processor and blend until smooth. Pour soup into bowls; add additional toppings. 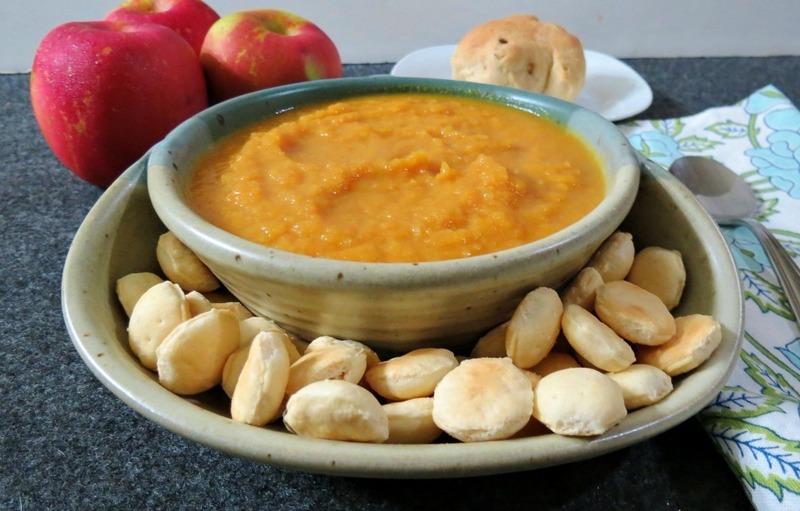 This was the first time I ever had carrot soup and I will be sure to make it again, on the other hand to be honest, my Husband wasn’t to keen on it. He said it tasted like squash to him. He sees orange and automatically thinks squash or sweet potatoes. 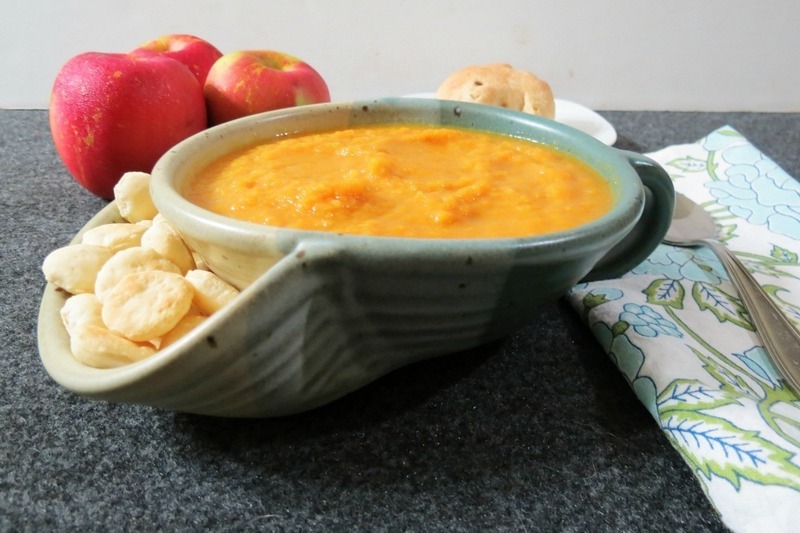 I think this soup would be perfect as an appetizer soup before serving a holiday meal!! On with the new bowls, as I was using them, you know what I thought of a great use for them would be? Peanut Butter! Yes a big bowl of peanut butter and I could put cut up apples in place of the cracker spot. I think that’s a pretty cool idea and you know what? I have a new PB recipe I am going to make this weekend!! he he I can’t wait! I was given these soup bowls from Uncommon Goods to review, and I have been very happy with them and all of their products. If your interested in seeing what other goodies and unique Christmas items, totally check out them out here. Can you believe Black Friday is less than two weeks away!! Ahhhh!!! Soup always calms me down…always. Partly because it’s just so comforting and partly because knowing how good it is for me, just makes me happy! This sounds really delicious. I’ve made carrot soup before but never with the fennel and apple. Great additions! Your soup looks delicious. Sorry to hear you haven’t been feeling well lately! I also have problems with anxiety when too much is going on…sometimes we all just need a break from life!! Get a lot of relaxation this weekend =) Sometimes hiking outdoors or taking a day trip somewhere to just relax really helps me! This soup looks delicious and sounds so heartwarming! 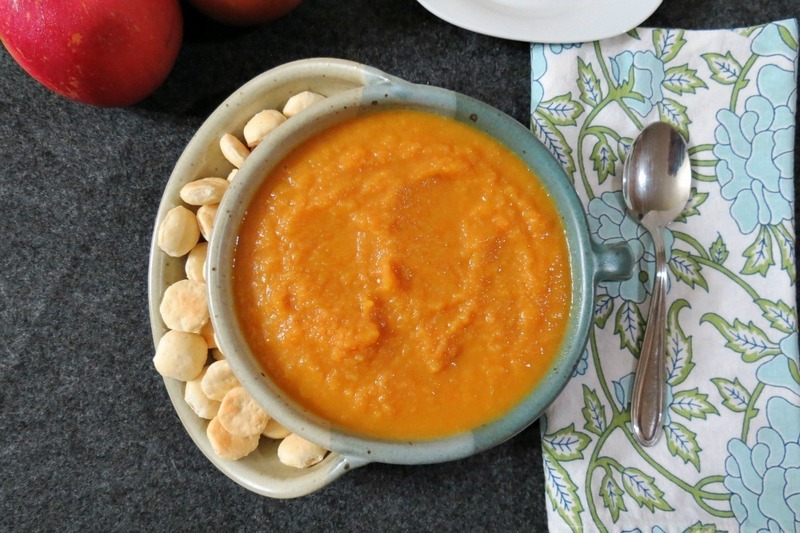 I’ve never made a carrot soup before, but I love the sound of this, especially with the apple. I hope this week is going better for you. I love doing yoga to relax…maybe it would help? Hi! Things are going better for me. I’m thinking now maybe I was a little sick and I just didn’t realize it until I got home? I got some well needed sleep and I feel back to my old self!! Thanks for letting me know! I had no idea, I’m honored Javelin posted one of my pictures. 🙂 Hope your having fun at your festival! I saw this in your Thanksgiving Recipe list and had to take a look. 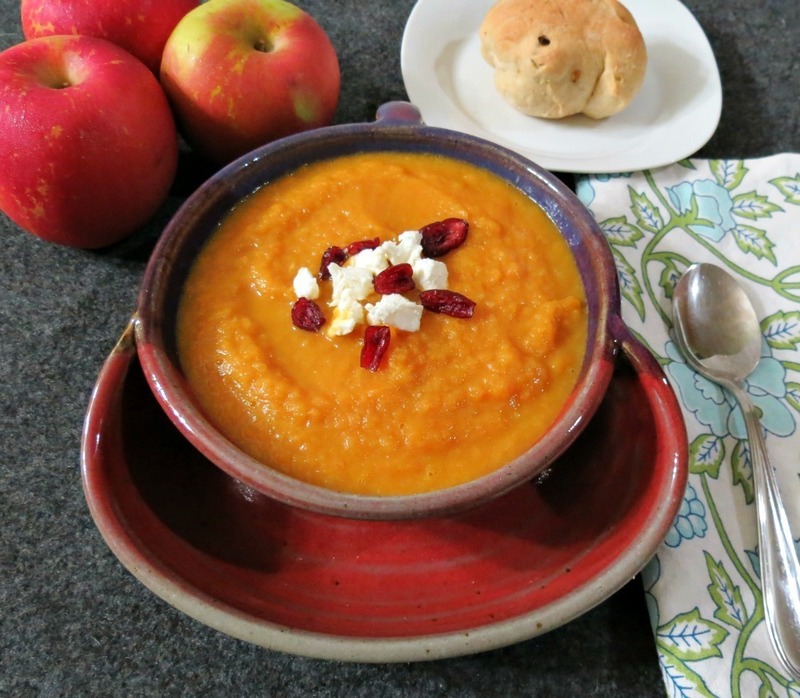 I love the idea of the fennel, carrot, and apple combo, that sounds right up my alley. And as for your husband, so what if it is like squash? That would be good, too? Hope he comes around on his veggies. OHMYGOSH! This is wonderful – easy, and delicious! I took it to work for my lunch and another helping for my co-worker to ‘taste’. She at it all!!! Thanks so much for sharing. Oh, and it’s very Weight Watchers friendly! 3 points for a cup!